As the housing market has strengthened and consumer confidence has returned, the hardware store industry has steadily grown over the past five years. Homeowners have returned to home improvement projects. Low mortgage rates have encouraged individuals to purchase and renovate new and existing homes. Recent activity in the homebuilding, as well as, home remodeling and repair sectors has driven demand for products and services from both contractors and do-it-yourself consumers. Increases in these drivers are expected to help industry revenue and the next few years are expected to see stable industry growth at about 3% to 4% per year. Over the last five years, the hardware store industry revenues have increased 3.2% annually to $22.6 billion. The hardware store industry is diverse and sells everything from building supplies, lumber, hardware, and tools to other home improvement products such as plumbing and electrical supplies, lawn and garden products, and paint. Small hardware store companies can compete by offering specialty products, providing superior service or serving a local market. If you are considering the purchase or sale of a hardware store, Transworld is committed to ensuring the best deal for all parties involved. Transworld's business advisors will meet with prospective hardware store buyers to determine your abilities and interests, educate you about the search and buying process, and connect you with hardware store sellers that match your criteria. 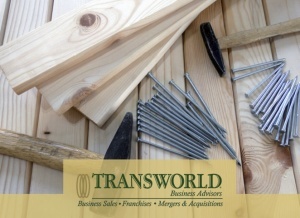 If you are interested in selling your hardware store, Transworld's experienced advisors will offer you full marketing support, including expert valuation and strict confidentiality, as they introduce you to suitable prospective buyers. Transworld will be involved at all stages until the hardware store changes hands and even beyond. Click here to find our listings of hardware store businesses for sale. We offer a detailed description of each hardware store for sale, along with some basic business information, such as price, down payment, number of employees, and current inventory.